Many of us love a good cup of coffee in the morning. Or the afternoon. Evening, maybe. Any time at all, really. Nothing quite perks you up and gets you ready to face the day’s challenges like a good cup of joe, but quite a few folk still rely on freeze-dried granules to make their coffee. Thankfully, Siemens coffee machines are here to offer a solution. Something that may surprise you is that Siemens has a long, storied history with coffee. In fact, they’ve got over a hundred years worth of experience with coffee and coffee machines; the first electric coffee maker, release in 1911, was a Siemens product. The company continued to innovate in both technology and design as the decades went on, producing the TC 12 drip coffee machine in 1963, the first espresso centre in the 1980s, all the way up to today’s modern EQ series machines. That dedication to both design and efficiency is something they’ve continued to hold on to, and as a result their current line of coffee makers are some of the best on the market. Particular mention must go to their fully automatic line of coffee machines, which have reduced the coffee making procedure down to a simple selection of settings on the users part. This ensures that the coffee it makes, whether it be an Espresso or a Mocha, is absolutely perfect every single time with as little effort as possible. Several features can be thanked for this; firstly, there’s the sensoFlow brewing system, that keeps the water constantly boiling at just the right temperature. The coffeeSensor functionality adapts to each variety of bean, grinding the exact amount needed every time. And then there’s the singlePortion cleaning system, which thoroughly empties all the pipes after every brewing process. Those are only a select few options available across Siemens’ EQ range, but we think that should be enough to entice you to check them out further! 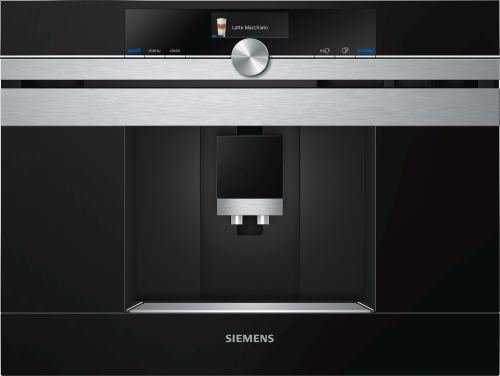 Of course, if you’re looking for something a little more hands on and traditional, Siemens offer a range of filter-based coffee machines in addition to their EQ range. Just because they’re more traditional doesn’t mean Siemens haven’t innovated here, however; additional features include a drip stop function that engages when the jug is removed, and designs that allow for easy access to the filter compartment and storage of the jug. Whatever your fix, Siemens coffee machines are more then ready to bean you!